Do you ever see something on the road that just doesn’t belong there? Now I’m not talking about animal carcasses or furniture that has fallen off the truck and landed on the road. Here’s an example of what I’m talking about, there’s a Pepto-Bismol pink explosion on the road into town. I’m sure many wonder what’s happened here, but I know the story. This is a slice of life from my neighbor, Dan. Dan headed into town to fetch several items his wife needed for a recipe. The sun had set, it was dark as there are no street lights along this road. He was tooling along the road (probably trying to remember what he needed at the grocery store) when suddenly, he heard a clunk! and bam! He was afraid that he’d hit an animal. However, he did not stop to investigate. He was on a mission to get these ingredients and return home as quickly as possible. Time in the grocery store was uneventful. He returned home and resumed his life with no thoughts of that clunk! and bam! Until the next morning . . . Pink embedded in the tread of the tires. driveway to get a better view. Pink paint had sprayed all over the side, on the tires, and under the truck. It didn’t wash away! He headed to the nearest auto supply store to see if they had some magical way to make the pink go away. He came home with a bottle of very expensive cleaner to begin the process of removing the sprayed on pink paint. Fortunately, he was able to get most of the pink off the sides of the truck. However, the tires and underneath were more of a challenge than he wanted to tackle. They are still sporting their new pink look. Every day Dan drives over the pink explosion on the road. I’m sure he has some choice words running through his mind as he runs over that spot. Every time I pass over the spot, I chuckle to myself while being thankful it wasn’t me and my vehicle who created the explosion. So the next time you see an explosion of color on the road, remember, someone now has a vehicle sprayed that color in places you can’t even imagine. Sometimes, when you least expect it, a connection pops up in your life. Those moments blow my mind with the connections that lay under the surface of living. Here’s what I’m talking about . . .
Our neighbor from across the street, Blake, comes over and says, “Did you see the ambulance and firetruck last night about 2 a.m.?” What!? How did we miss this? Through the process of elimination, we figured the rescue vehicles must have been at a young couple’s house. This couple does not socialize in the street with the rest of us. However, we did know the lady was pregnant. The cloud of mystery hung over that house as we went about our daily lives. Later, my husband began talking to an older couple who were out for a walk. Yes, the emergency vehicles were at the house in question. The baby had been delivered earlier in the week and they were the parents of the mother. The new mother had stopped breathing, which was the cause for the first responders. She was fine now. The man was wearing a T-shirt that said Sedonna. My husband commented that was a very nice place. The man agreed, then proceeded to tell my husband that his sister used to live there, but she recently sold everything and moved to Ecuador. He was not happy about that move. Ding, ding, bells went off in my husband’s head because I have a friend, Janet, who just went to Ecuador with her sister, Cathy, this summer to visit her best friend from high school. This best friend moved from Sedonna. “Does your sister have a best friend named Janet who visited her this summer?” inquired my husband. A look of surprise washed over his face. “Why, yes!” Now that makes you think small world, right? There’s more. Through further conversation, my husband discovered this man knew my father and another family friend. It’s amazing how the threads of lives connect and intersect. Sometimes all it takes is a little casual conversation to discover the links. The heat covers me like a blanket, so heavy that it brings me out of my dozing state. Eyelids flutter, trying to open and focus on the time of day. It is 3:00 in the afternoon, my eyes close again as my thoughts drift back to only twelve hours before. Twelve hours ago, I was driving towards St. Louis, following my husband who was driving our neighbor’s car. Flashback to late afternoon, we get a call from Dave, “I’m taking Sue (his wife) to the emergency room. I’ll let you know what’s happened,” he briefly explains. Mike checks on Dave when he arrives, Dave is in no frame of mind to drive three hours to St. Louis. Mike offers to drive him and I will follow so Dave will have his car. We can spend the night at my father-in-law’s house (near St. Louis). Quickly we throw together items we will need in the morning. There is a delay, Dave has to return to the local hospital. The hospital will not release Sue until a bed is assigned in St. Louis. The time ticks away. I returned home to wait. They do not leave the hospital until 12:15 a.m. I dozed a little while waiting for them, I only hope I am up to the task of driving at such a late hour. The miles are eaten as I am focused on being alert to all traffic. Eventually we arrive at an exit where Dave will take over driving and we head for the house. The last time I’d seen 3:30 in the morning, I was on an international flight. I fall into bed exhausted, but yet sleep eludes me for a while. By 8:30 a.m., we are up and ready to begin the journey home. It was a short night. Once home, a nap is required after lunch. I move to the patio. It is warm, but there is a slight breeze that allows me to drift away, until I begin to suffocate under the blanket of heat. Update on my neighbor: Many tests were run on her. The test with positive results was related to a tick bite. We have no idea when or where she encountered a tick. She is still in the hospital, but hopes to be released today. When I left to do my weekly grocery shopping, my husband was planning on getting some yard work done. It was a rare day that allowed him to be outside preparing the yard for spring. His goal was to cut down the liriope that borders the walk to the front door. When I returned several hours later, the liriope was only half pruned and my husband was straddling bushes holding a shovel. My neighbor, Dave, was brandishing a pitchfork in another area of the front landscaped bed. A portion of the decorative rock was shifted, the black mat was pulled back, and the ground underneath was muddy. It didn’t take me long to realize they were on a mole hunt. The bed looked like a bomb had exploded and craters were everywhere. When my husband had started to clip the liriope, he discovered a hill of dirt had been pushed up, a sure sign of a mole’s presence. That creature is a four letter word in our household. My husband decided to take action because he knew the runs were fresh. Dave came over to help. As they plotted their mode of attack they could see the ground moving. Immediately they sprang into action with the hose. This little fellow was about to experience a water slide. When the hunters heard the rock moving, Dave began to stab the ground with the pitchfork, hoping to impale the critter. My husband was digging to try to unearth the unfortunate mole. When I arrived, they were frozen over the landscape, listening for any sound, looking for any movement. They were satisfied they had been successful. I went into the house, and the hunters were pondering their next move when the ground began to move again. This time a grandson of Dave’s had joined the group. He began stabbing the ground with the pitchfork and when he pulled it out something was attached. Dave attacked with the grass clippers. My husband grabbed a bucket from the garage to capture the critter. I was called outside to view their prey. This mole had been feasting because it was a fat fellow. Unfortunately for him, he chose the wrong yard to burrow in and his life was at its end. It’s been a few days, no new mole mounds have surfaced, so I hope the mole drama is over and word spreads in the tunnels of the danger lurking above. Another Saturday rolls around and it’s time to take inventory on celebratory moments of the week. Snow and bitter temperatures were predicted for Sunday. That was to be my travel day to head towards St. Louis for work during the first full week of January. Fortunately, my father-in-law lives outside of St. Louis, so my husband insisted that I leave Saturday afternoon to avoid any chance of encountering inclement weather. I arrived safely and well ahead of the storm. The storm arrived during the night. Sunday was spent watching the swirling snow create snow dunes in the yard. I was not surprised when school was cancelled for Monday. It just gave me the opportunity to snuggle down and finish reading my book. Temperatures and road conditions kept us inside for another day, but it also delivered another cancelled day. No school Tuesday either. Mentally I was planning how to revamp my plans for five days down to three days. The text dinged, No school Wednesday. That’s it, I will cancel the rest of the week. It will be much easier to make it up later. Wednesday morning I was headed back home. Lots of semis were stranded in the median, but the road was clear for me. Thursday brought another round of slippery roads and cold temps. I was glad to be home where I could begin working on future plans. Later I found out St. Louis did not go back to school all week, so I was a good thing I came home when I did. 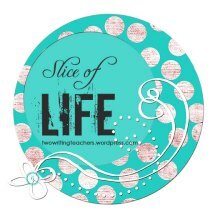 Inscription says: Here’s to poetry, math, and pie!! Once again I must celebrate the helpfulness of our neighbor. Our garage door opener stopped working. Our neighbor, Dave, worked with my husband to try to solve the problem but nothing worked. They replaced the unit. It was a quick and easy joy with the help of Dave. 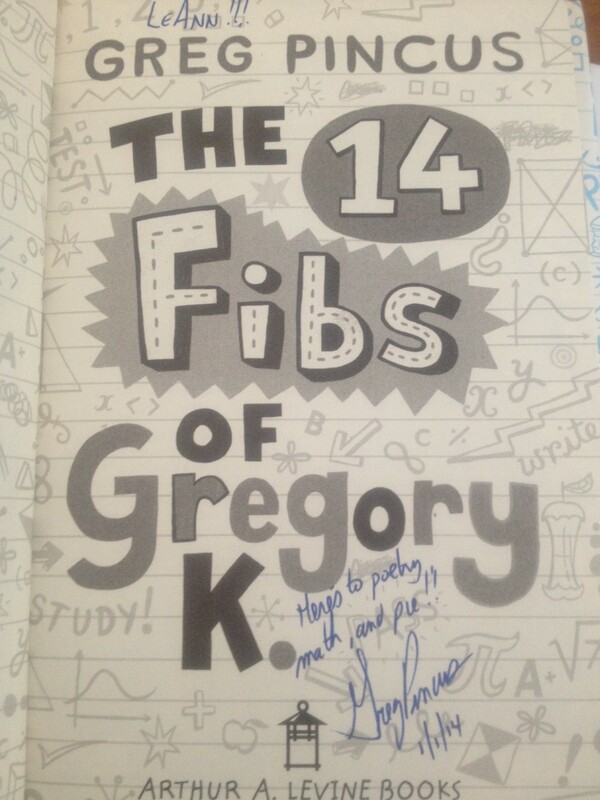 Finally, last week I wrote about my luck in winning a book from Teaching Authors. Today it arrived in the mail. Wow, that was quick! I can’t wait to read this. Life is full of celebrations, you just have to be on the look out for them. Have a great week! Saturday morning we awoke to another couple of inches of snow covering all surfaces. 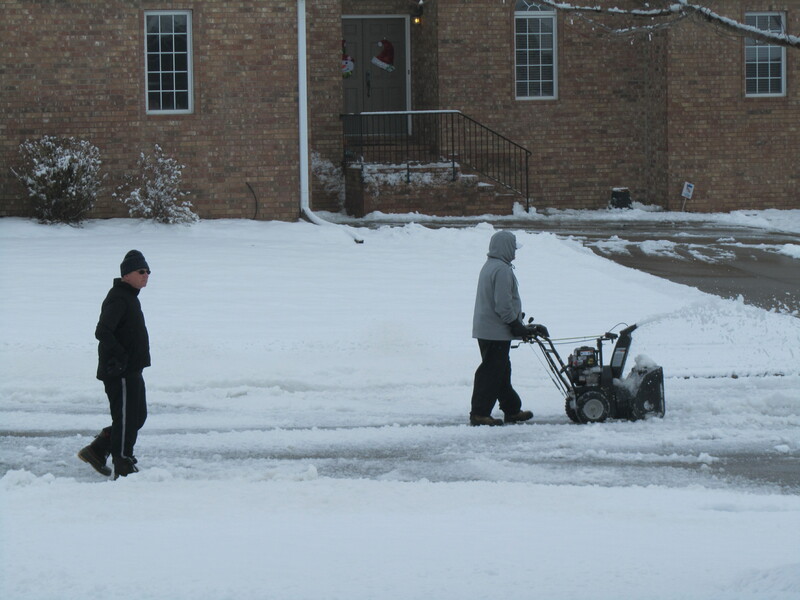 Once again, driveways previously dry and snow free were wet and coated with a combination of ice and slushy snow. It was time for the most popular guy in the neighborhood (my husband who owns a snow blower) to begin his rounds of the driveways. 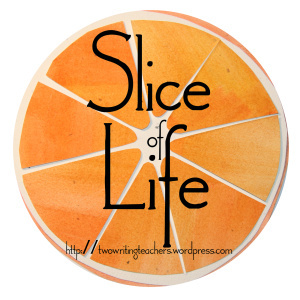 As he began the up/down, back/forth movements, I contemplated what I could do to help. I knew I would be no help in snow removal, but I could have a baked product ready for the weary, cold snow removal man. I set about creating some blueberry muffins ready to pop in the oven when my husband stopped. He didn’t stop for three and a half hours. The muffins became a side to join the soup for lunch. Once the muffins (unbaked) were ready, I headed to my desk to begin working on a presentation. The phone rang as I was reading an article I considered using. I sprang from my chair, ran to the bedroom to grab the phone before the answering machine kicked in. The following is the conversation with my neighbor Dan. Dan: Is this Mike’s Snow Removal service? Dan: When is he getting started? Me: He’s already out there. Have you checked your driveway? I see he’s been across the street and he’s working on Dave’s right now. Dan: You know if you ever move, there had better be an empty house next door to you, because I’m not ever letting you go as neighbors. That Mike is one to keep! Me: (laughing) I agree, he is a hard worker. Me: Well, no I do not know how to run the snow blower, but we do have the instruction book, so I’m sure I could figure it out. Dan: That’s good, but maybe you should check it out. Me: Good-bye Dan. Check your driveway. Later I am at my desk, with a view of the street and who should appear? Dan. He approaches my husband. I can tell he wants to know how to work the snow blower. The drives are all clear, but a plow has come through and created a mess. It left knee deep mounds in the middle of the street. Cars will not be able to make it down the street once this mess freezes up later. So Dan is getting his lesson on snow blowing 101 by taking down the mounds. Soon Dan heads back inside,I guess he is satisfied he knows how to run the snow blower. I think he got the hang of it. I guess I won’t need to dig out the owner’s manual to learn how to run the snow blower. While the snow blowing was happening, the neighbor to our left, Dave, knocked the snow out of our satellite so we could get TV reception. Another neighbor had KC barbecue sauce and homemade peanut brittle for us (she makes the brittle every year and it is soooo good!). We are truly blessed with good neighbors. I don’t plan on moving for a long time (that will make Dan so happy 🙂). It’s time! It’s time! 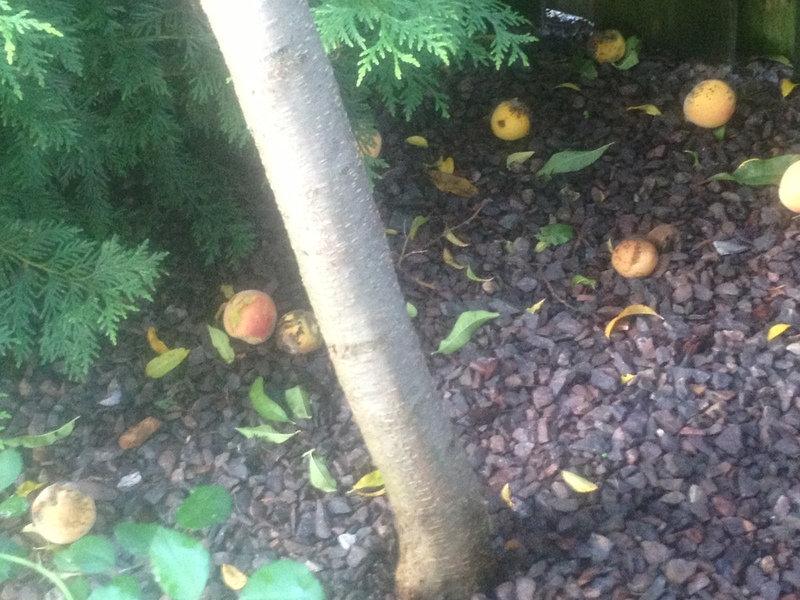 My peaches are ripe and ready to be harvested. 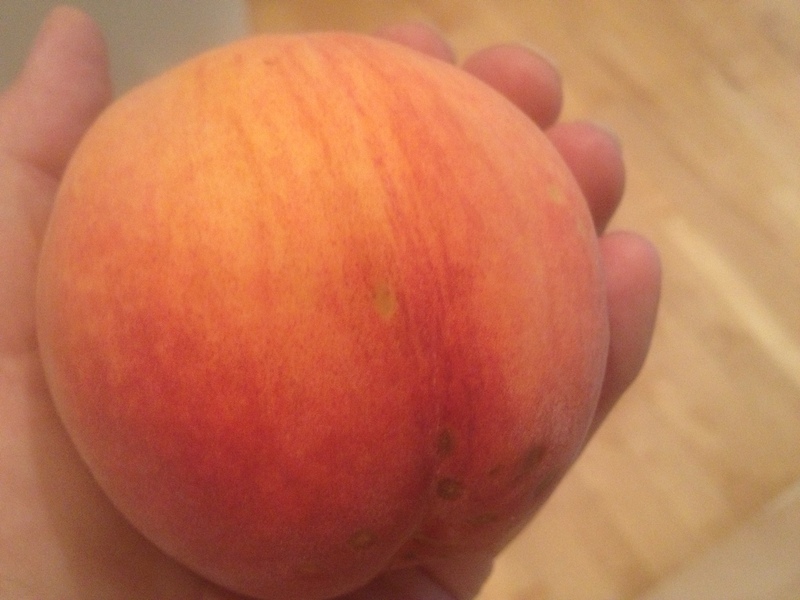 I did not get one peach from my tree last year because I was away on a trip. My neighbors helped me out by gathering and enjoying every golden morsel. This year I planned my trip before they would be ripe. Fortunately all plants were late this year, so I was home in plenty of time. After returning home from my vacation, I continued to check the fruit on my tree. There were lots of peaches, but they were small. I removed some hoping that would give the remaining peaches extra nutrients. Day after day, I would tenderly caress the fuzzy ball hoping to feel a softer flesh, but they remained rock hard. Then we were hit with rain and more rain. I longed for sunshine to change my peaches from pale yellow to a rosy golden orange. Between showers, I checked on the peaches, but still they were not ready. Would they ever be ready? Last year they were gone by the last week of July. We are now in August and I still have not had one peach from my tree. All that changed when the rain stopped and the sun returned. I went out to inspect my crop and discovered they were falling on the ground. The fruit flies were feasting on these peaches. Quickly I began checking, yes, they were softer! They began to fall into my hands as I touched them. I ran into the house to get a bowl to collect them. Bowl after bowl was filled and emptied onto the counter. . My husband brought the ladder around so I could gather more. Higher and higher I went plucking peaches. Each peach stretched my smile a bit wider. I surveyed the counter and wondered what I was going to do with all these peaches. I have no desire to create jam or preserve them. So I began bagging them up and traveled to the neighbors delivering juicy sunshine. They finally grew! Of course they weren’t all this size. I eat peaches for breakfast, lunch, and dinner every day and I savor every bit of that sweet juicy fruit. 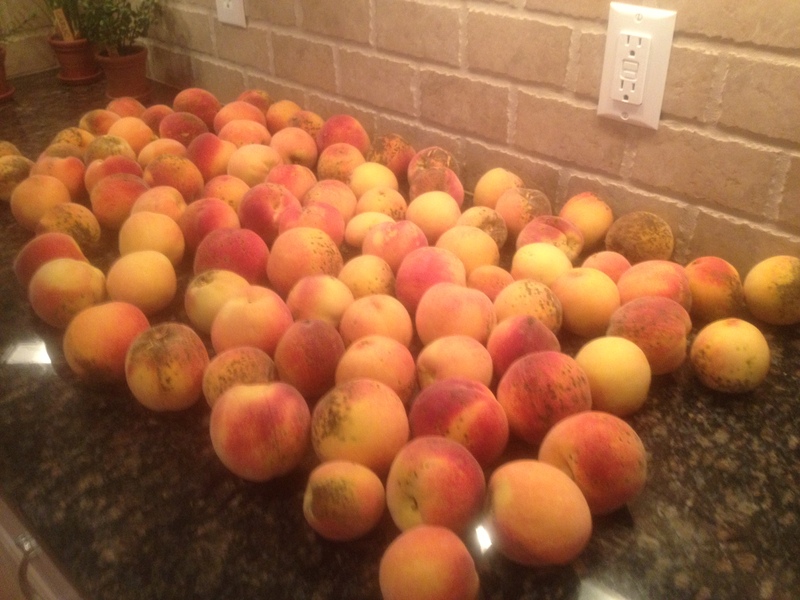 There are still more on the tree, so I will be in peach heaven for a bit longer. PS: As I was preparing this post my neighbor brought me some warm peach cobbler she made with my peaches. Can it get any better than this? Yum!